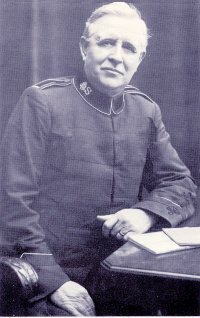 General Higgins, the first elected international leader of The Salvation Army, became a Salvationist at Reading Central. On Sunday March 27th 1881, The Salvation Army opened fire in Reading. The Reading Corps was given Number 188, reflecting its early foundation. The venue was an old boathouse in Willow Street by the river Kennet close to where the Fynn Loch restaurant is now. The chief protagonists were Major W.F. Day and Captain Charles Harrison. That first meeting was not without incident as the two founding officers were to suffer at the hands of local opposition as they made their way home. Several young men were charged and convicted of shoving and pushing in King's Road. Following the intervention of the Mayor of Reading, the evening meeting was cancelled to avoid further unrest. Later that week however, the Berkshire Chronicle reported that an Army contingent was heard singing in the Market Place and in Broad Street. Early in June 1881 General William Booth visited the town and conducted meetings in the boathouse. On his arrival at the railway station he joined a march, headed by the newly formed band. By late June, the Corps was moved from the boathouse due to pressure from brewers. Nevertheless the early day Corps found temporary accommodation before new premises were built back in Willow Street. These premises took only 6 months to plan and build and were reported to accommodate about 1000 people. They were opened on 6th December 1881 and William Booth came to celebrate the opening. At the opening, about 500 members were present for a celebration tea. These buildings were the home of the Reading 1 Corps until 1906 when the railway company made a compulsory purchase when Coley junction and goods depot occupied the area. Joseph Fidler, the Recruiting Sergeant and Songster Leader, secured new premises in St Mary's Butts. With a secure central position, the Army was able to consolidate its work and The Butts continued to serve as the home of the Corps until the Reading Borough Council decided to build the Butts Centre, now known as Broad Street Mall. Having compulsorily purchased the hall in the Butts in 1969, the Council made the site of our present hall available. However a hall had to be built and for almost a year the Corps was homeless. Fortunately Broad Street Congregational Church (now Waterstones book shop) came to the rescue and allowed us to use its hall and a complicated system of sharing took place. The present suite of buildings was built specially for the Army. Constructed within a period of 12 months to a design and specification that, at the time, were the envy of many Corps, the buildings have provided fitting accommodation for the many aspects of present day corps life. Much of the success of the building project was due to Corps Secretary Percy Clarke, the local architect appointed by the Army's architect's department. After 44 years the building was in need of repairs and upgrading for the needs that we encounter in the 21st century. For about six months our activities were located around the town. However we are now back in our own home. In the early days at Reading Central, hundreds of people were converted and joined the Army's ranks. Four notable people became soldiers at the boathouse and then became officers. Colonel Charles Miles later founded the Corps Cadet movement and also pioneered the Army's work in South Africa. Commissioner David Rees became Territorial Commander for Canada in 1895, only seven years after becoming an officer. He was travelling with the Canadian Staff Band on board the Empress of Ireland on route for the 1914 Congress when the ship was wrecked and the Commissioner was drowned. Commissioner Higgins and his son General Edward Higgins both became officers in about 1882. Edward Higgins became the Chief Secretary in the USA then British Commissioner and the Chief of the Staff. In 1929 he became the first General from outside of the Booth family. Mention has already been made of the role of Brother Fidler in securing the Butts Hall. He later became an Envoy and served the Army in a wider field and it was as Envoy Fidler he was affectionately known. There have been many other outstanding soldiers of the Reading Central Corps and no list would ever be complete. However mention must be made of early day Salvationists who travelled to Whitchurch in Hampshire during the late 1880s to support the local contingent which was experiencing enormous opposition from the brewing industry which had the backing of the local police and the magistrates. They went to help in the open-air campaigns which were opposed by a small but violent minority. In supporting their Whitchurch comrades they were joining forces with such distinguished Salvationists as Commissioner Evangeline Booth and Commandant Herbert Booth but they also risked imprisonment simply for preaching the gospel in the streets. Four Salvationists from Reading were amongst the 80 or so people who were imprisoned at Winchester by the authorities. Directly resulting from their courage and conviction, a High Court ruling eventually established the right of the Salvation Army to hold its services in the open-air. There are many serving officers from the ranks of the Reading Central Corps. Again, sadly no comprehensive list exists. Officers still serving, include: John and Dorita Wainwright, Stephen and Christine Perkins, Tim Johnson, Neil and Rose Denyer; there may be more. The location of Reading within an area of recent rapid commercial growth and situated within commuting distance of the capital city, has meant that there has been a rapid and almost continuous change in the names on the soldiers roll. There remains therefore, but few links with the very early days of the Reading 1 Corps. Just a few families have survived through all the changes and still make a major contribution to the corps. The family name of Bert and Daisy Clarke has survived all the changes. These early Salvationists along with Amos and Agnes Pendery William and Margaret Hamlett, Bert and Cissie Hamlett, Fred and Annie Mason and Frank Choules were in the thick of the early day action and today their second, third fourth and fifth generation descendants maintain the tradition within the present corps.. The Band has spearheaded the work of the Corps since its very early days. The earliest report of the band appeared in the War Cry of June 1881 when it headed the procession from the railway station to the boathouse when William Booth visited the town. It has operated continuously ever since. Its first journey overseas was to St Peterport in the Channel Islands. The second was in 1994 when the band spent Easter in South Korea, followed by a week in Hong Kong. In 2004 it released its third recording, Faith Reborn, and its second on a CD. In 2007 the band carried out a tour of Ontario, Canada. Its most recent CD, Vox Dilecti, was released in 2012. The Songster Brigade was founded in 1900 by Brother Fidler. The present leader is the 20th in a list of distinguished names that has included one Army composer, George Andrews. Karen was appointed as Songster leader in 2008. Amongst the former leaders still in the Corps are Derick Wiseman, Ken Kew, Eric Stoakes and Paul Mortlock. In 2000 the brigade released its first CD, A new song in my heart.